When in a new city, it may be a daunting experience since there a lot of responsibility when it comes to being independent. One of the first things one does is find an adequate living space. It may take some time and requires one to constantly check the Application Status of every place they applied to. 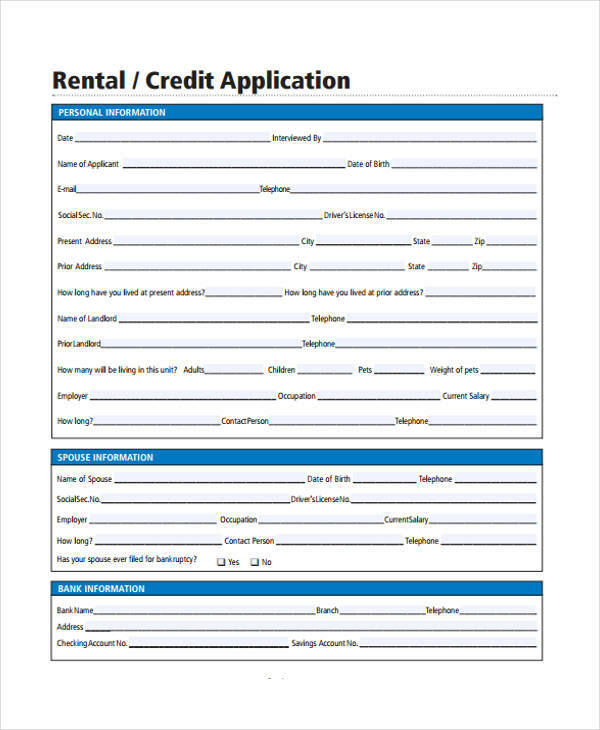 In order to obtain items that can help with life’s responsibilities, one must take the initiative and start filling up applications such as a credit application form. 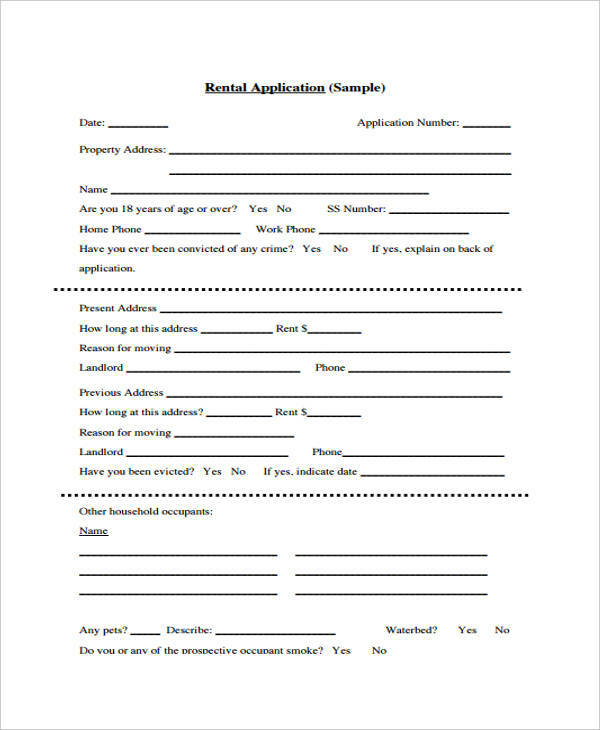 There a lot of legal documents that an interested tenant will go through before occupying an apartment and one of them is a rental application form. 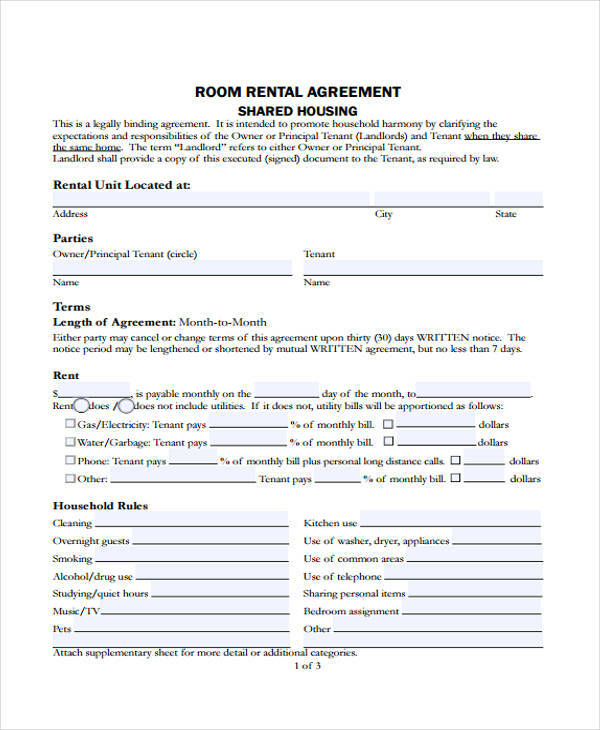 One of the responsibilities of the landlord is to make sure that the tenants occupying the property are individuals who are cooperative, responsible, and stands by the conditions in the rental agreement. They are expected to take initiative in acquiring methods and techniques that aid him or her in accomplish all the set responsibilities of their position. 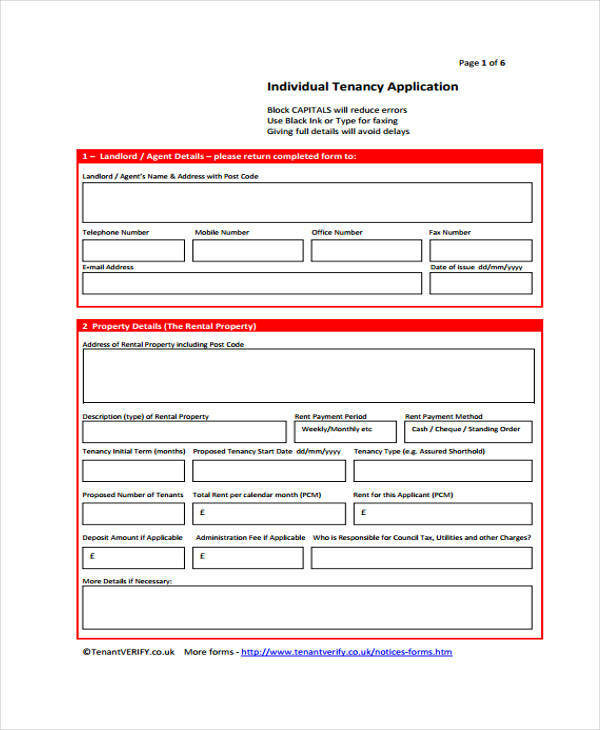 One way of keeping track of all the tenants is by letting them complete a rental application form. 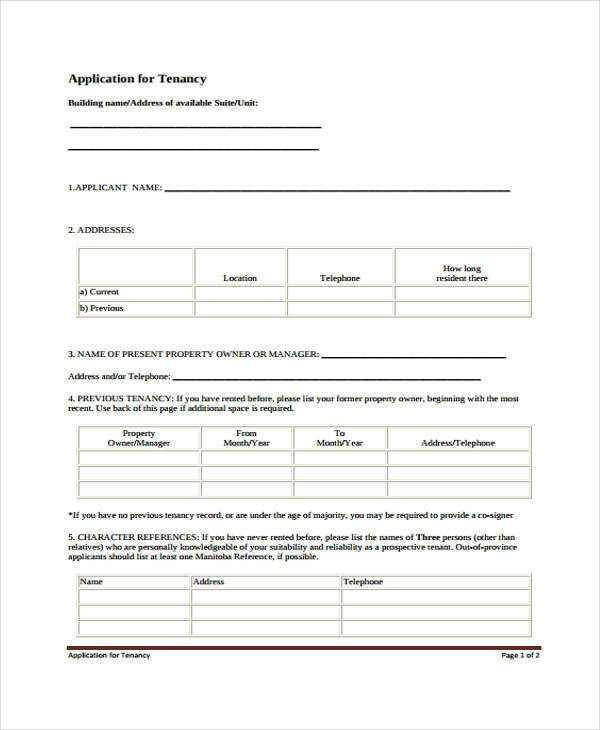 This form records specific details about the tenant as well as track their entire stay in property. 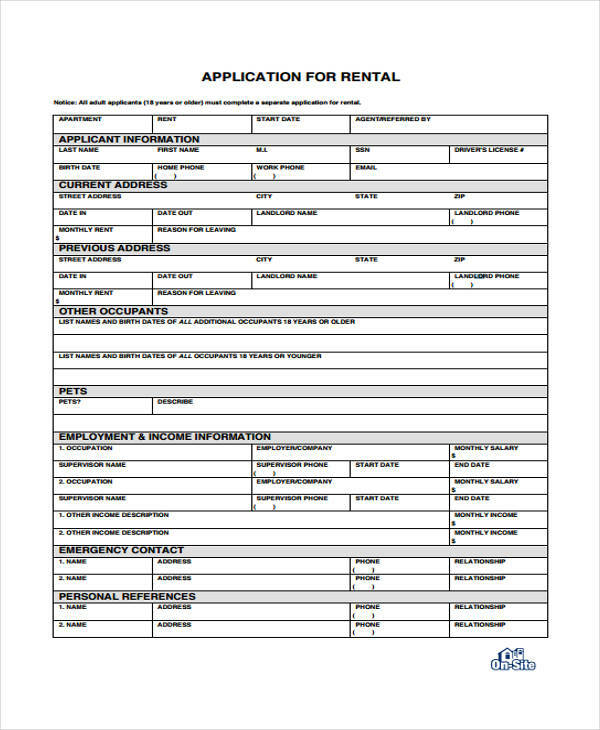 This can be made with the help of finding Rental Application Forms in PDF form or from scratch. 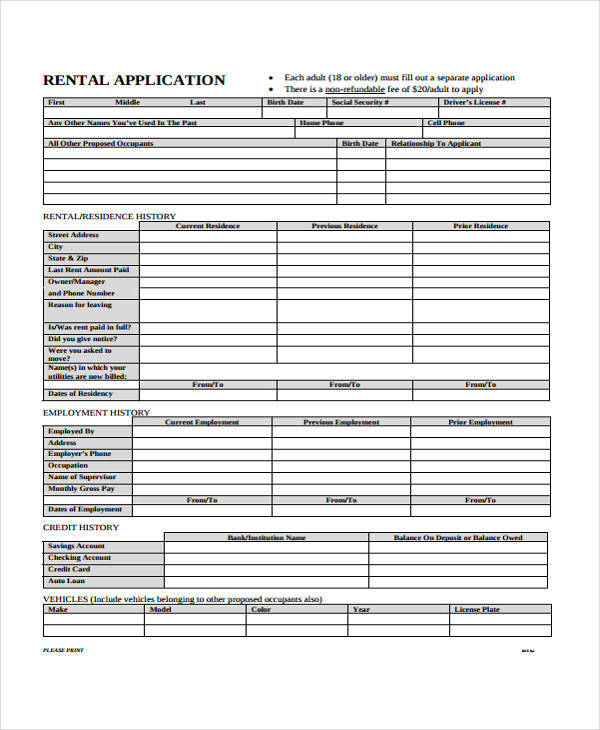 What Is The Content of a Rental Application Form? 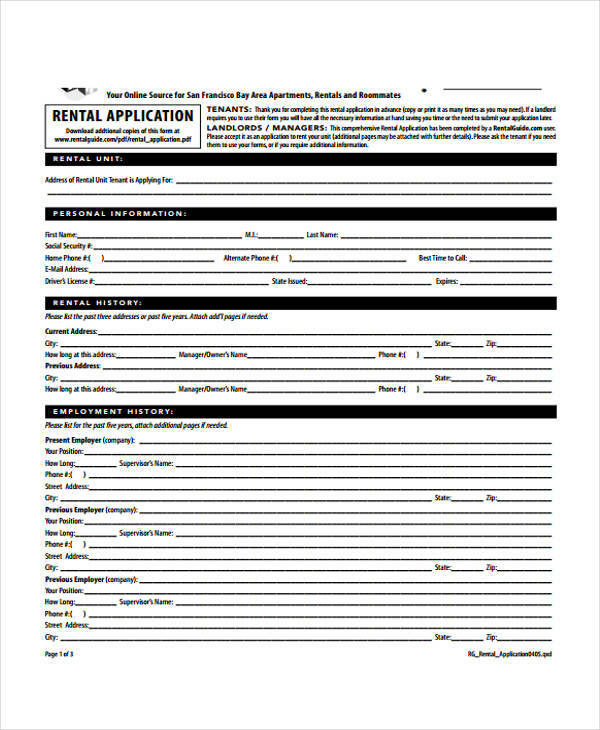 Rental Application Forms are forms provided by the landlord for incoming tenants to answer before officially occupying a part of the property. This process is a formality in which the landlord can screen every tenant extensively and ensure the safety of the property. 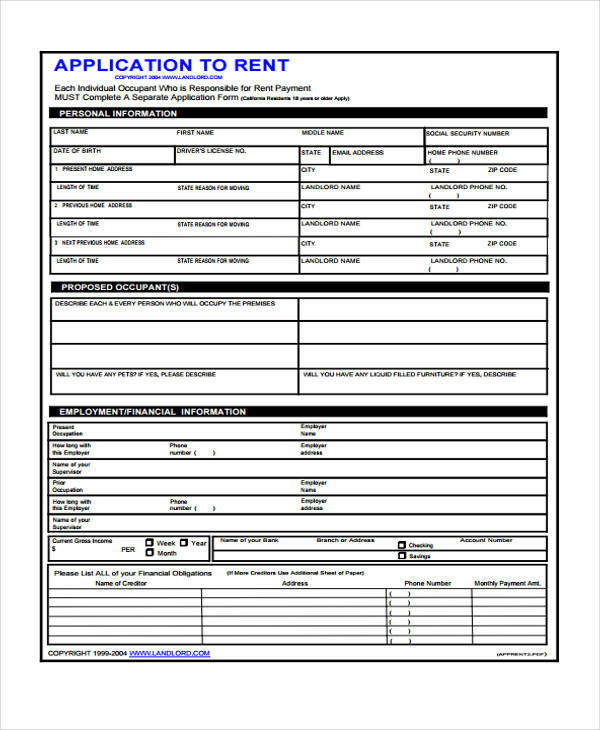 When one looks at a rental application form, the first section of items to answers are about the tenant’s general information such as the name, contact information, and government numbers. The next section to tackle would be the tenant’s rental or residence history. This would cover details related to his or her current, previous, and prior residence. 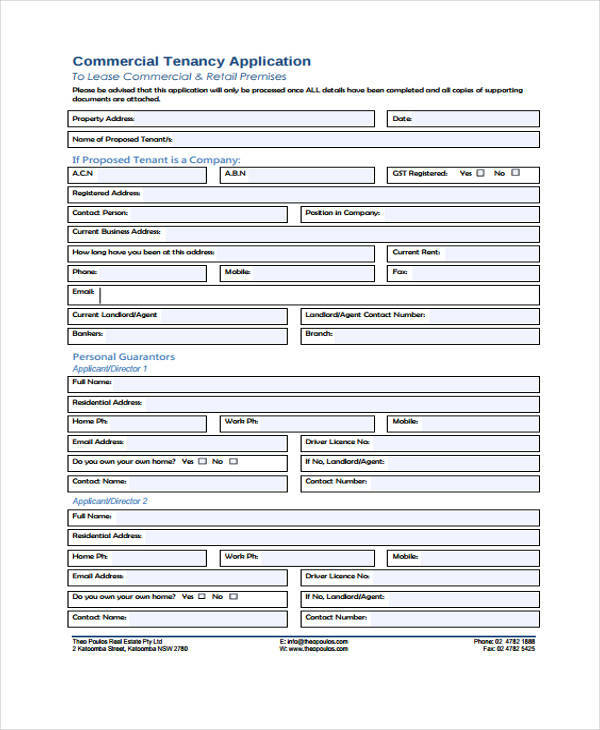 Other sections found are one’s employment history, credit history, vehicles, and emergency contacts. The utilization of an application can be done in a number of settings. 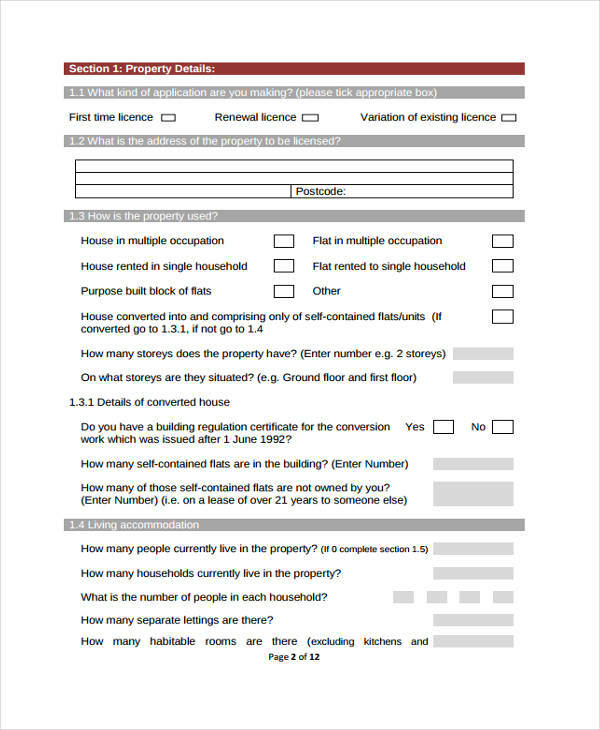 With these various settings, the format and content of the application form will coincide with said factors. 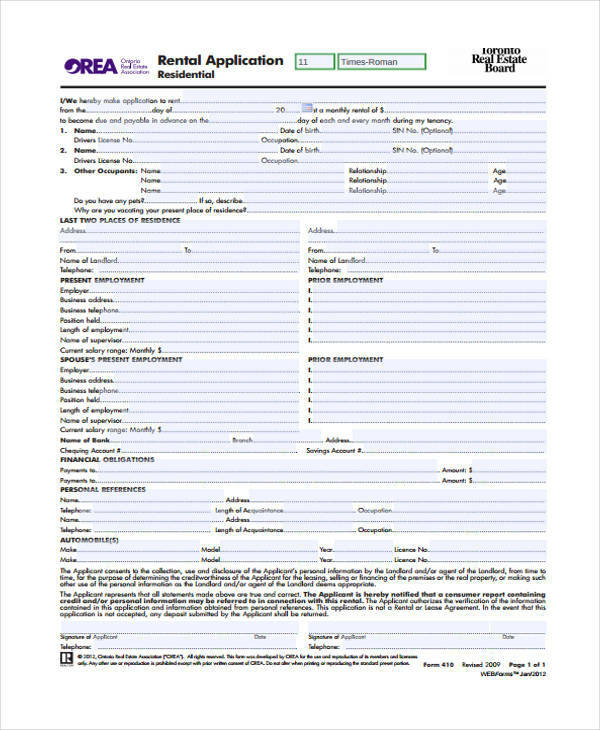 The primary function or purpose of an application form is to officially record an application’s information and background in order to screen them as well as their qualification level for the setting the form is used in. 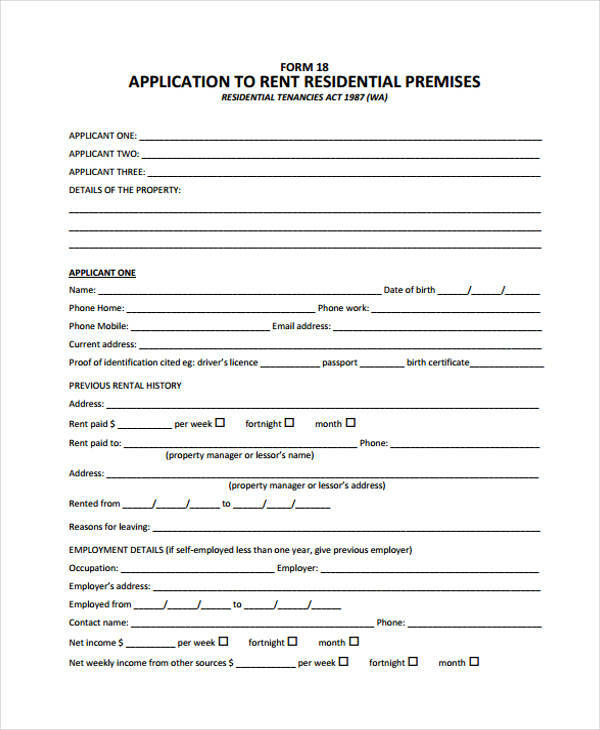 In the rental property business, one can come across Commercial Lease Application Forms and Apartment Rental Application Forms. 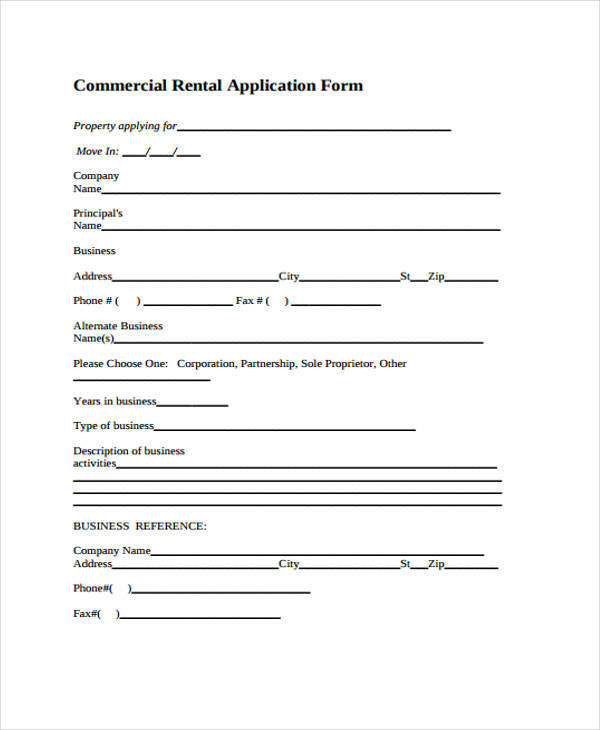 Commercial Lease Application Forms are typically used when there is a customer interested in renting or purchasing a commercial space. A commercial space can be found in malls and shopping centers. 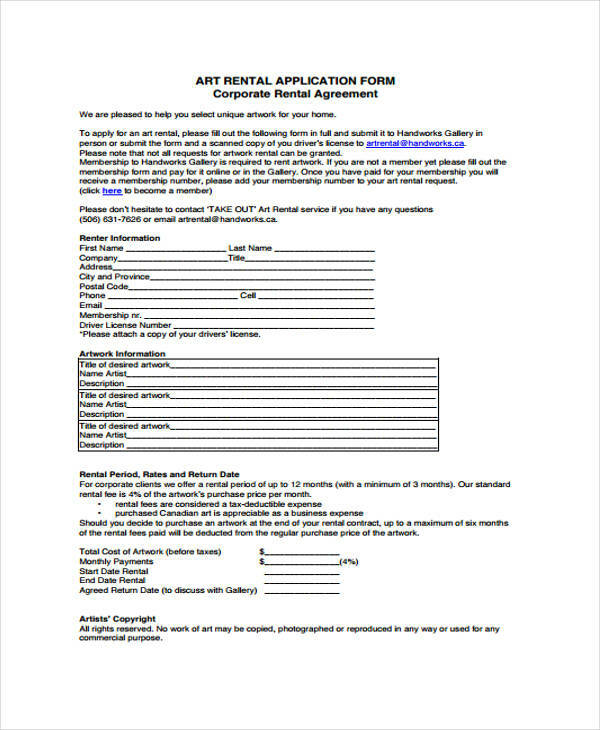 With the Apartment Rental Application Forms, an applicant is interested in renting an apartment space rather than a commercial space since it is suitable as a living place. For the industrial setting, application forms are administered to incoming applicants who are applying for a job position. It is important for the human resource department to find applicants that are qualified for the position since that can impact the productivity of the company. The application form can also be used in the educational field when students apply to the school that suits their academic needs. For any academic level, various schools and universities presents different programs with their own perks and advantages that are meant to show their specialties, stand-out qualities, as well as attract students to enroll in the school. 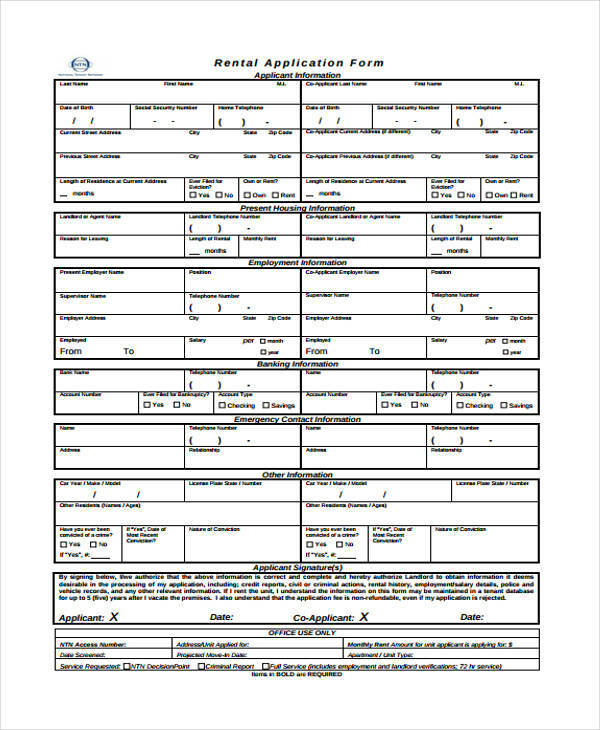 In the medical field, application forms can be similar to intake forms that patients answer before going in for a medical check-up with their primary care doctor or before undergoing a medical procedure. Medical insurance plans may be obtained by various patients and applicants in order to get help with their medical expenses. 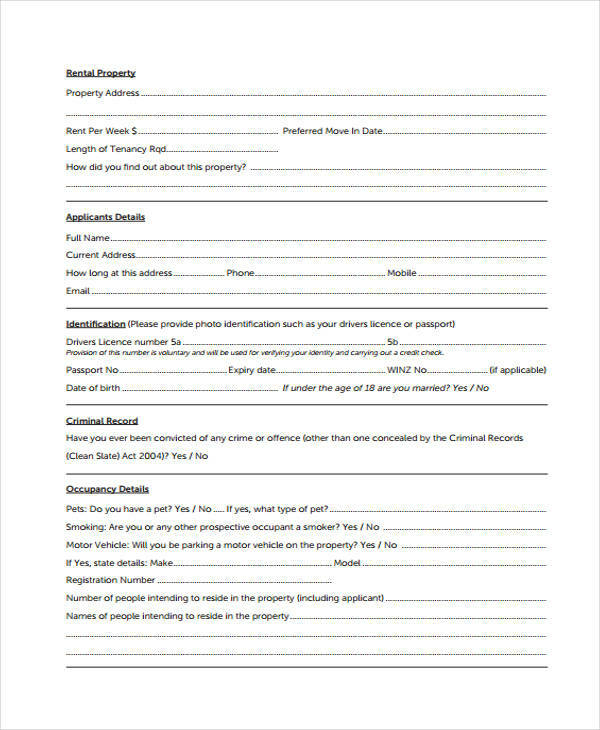 This can be obtained once an applicant completes an applicant form and other parts of the screening process. 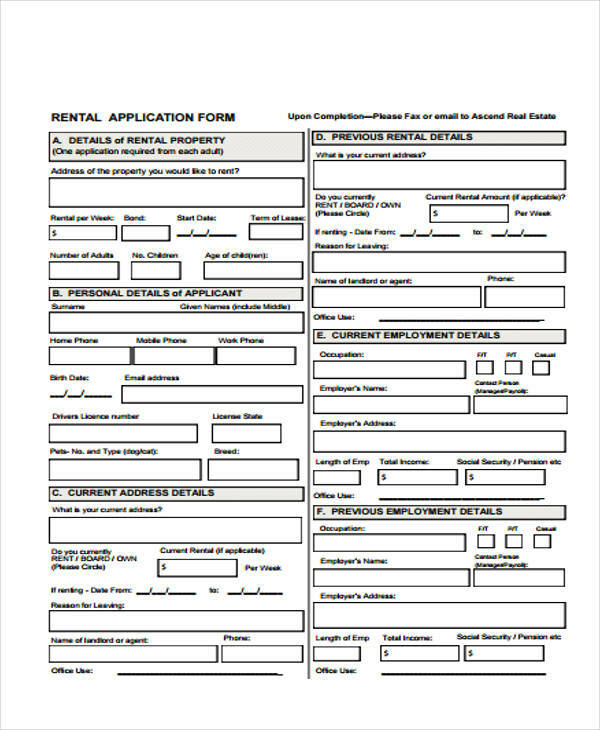 Renters Application Forms are legal forms which are contractual in nature. 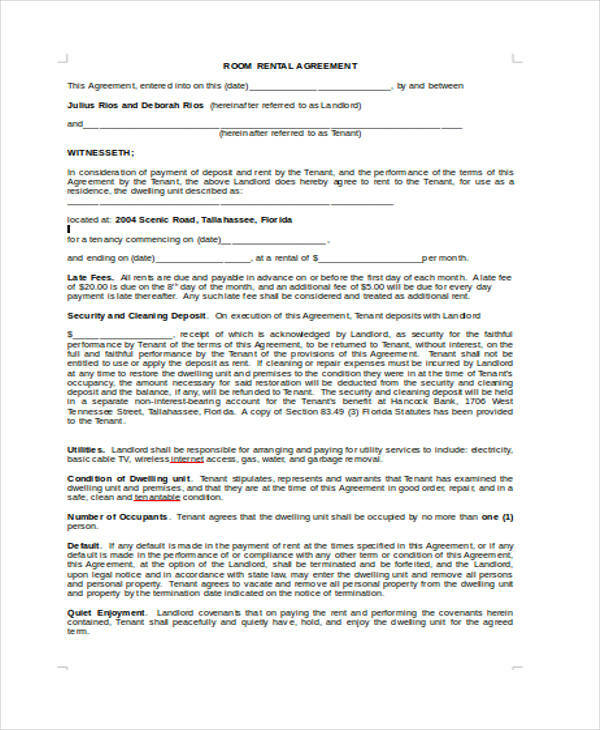 This would mean that if the tenant or the landlord violates any of the terms and agreements, they have to the face the legal consequences that correspond to such actions. The process to an incident like that may vary from landlord to landlord but some conditions remain the same among all of them. The process may start with the person in question explaining what had happened. The next action would be to give a time limit to correct the situation. Eviction may take place if the problem has not been solved or has been repeated. 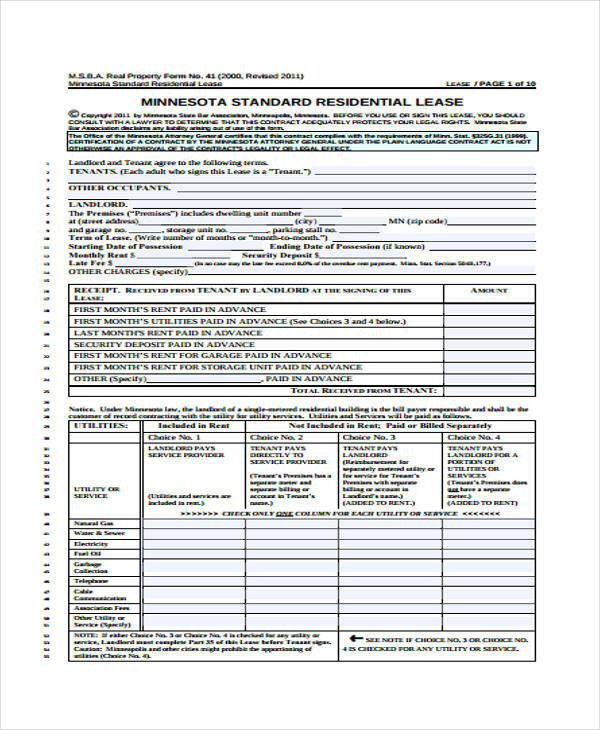 Formal documents such as Tenant Application Forms and Rental Agreement Forms contain a list of roles and responsibilities that both parties have to duly carried out. The landlord is the person who supervises the property as well as screen the tenants that are interested in occupying the property. The landlord should also not disturb the tenant’s possessions, to make the property reach appropriate health and safety standards, and to provide the appropriate legal documents when needed. On the part of the tenant, he or she should pay the rent on time, maintain the condition of the rental unit, stray from illegal activities, and not interfere with the rights of both the landlord and fellow tenants. 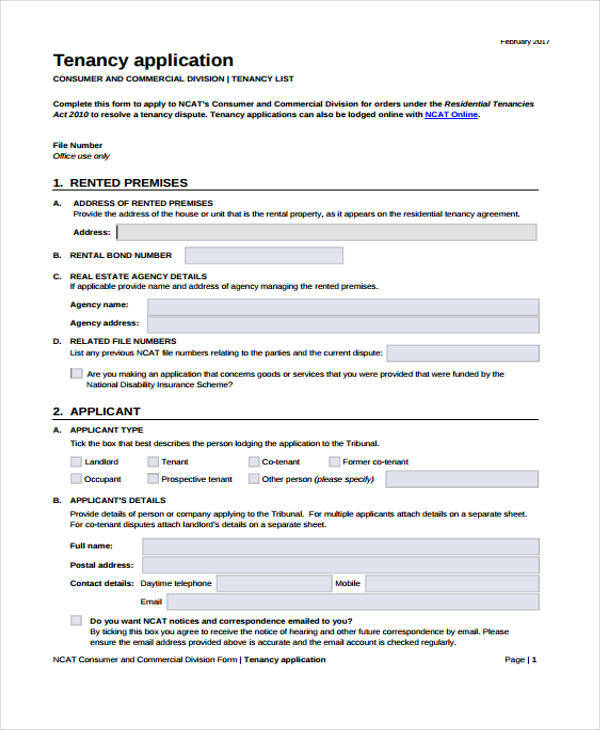 Why Is It Important To Use Application Forms? Any company, business, university, medical centers, or institution makes sure to stock up on legal and important documents in order to establish a systematic approach in organizing the various tasks and processes that each person is delegated to work on. In order for one’s workload to be more manageable, they have to incorporate such forms into their work routine. 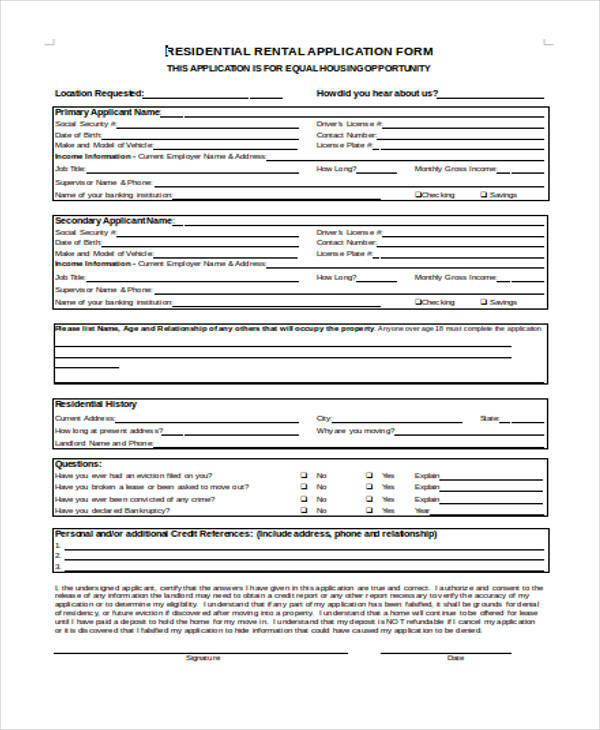 Among the many formal or legal documents one utilizes, Application forms are considered to be important documents no matter where and what they are used for. They bring benefits to those who use them since they establish a format which is considered to be structured and formal to use. 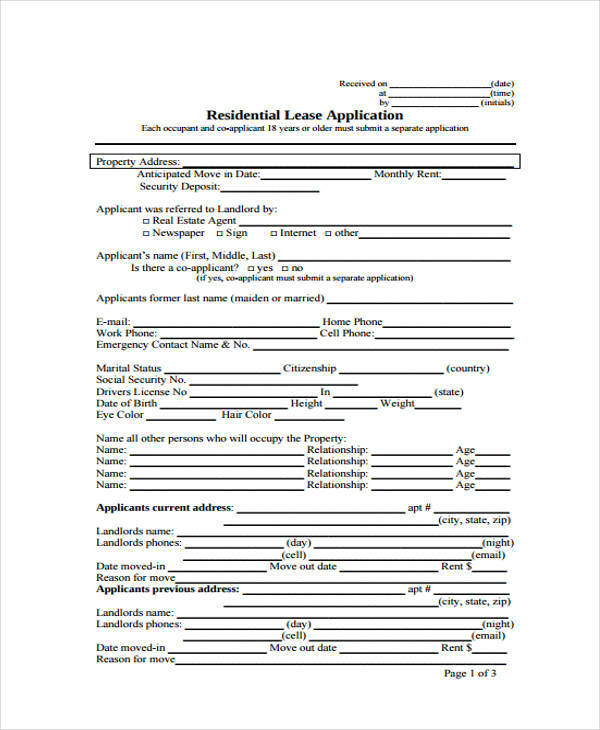 The content of various application forms such as a Lease Application Form and a Basic Rental Application Form help the application form users collect the necessary information they need from the applicant. 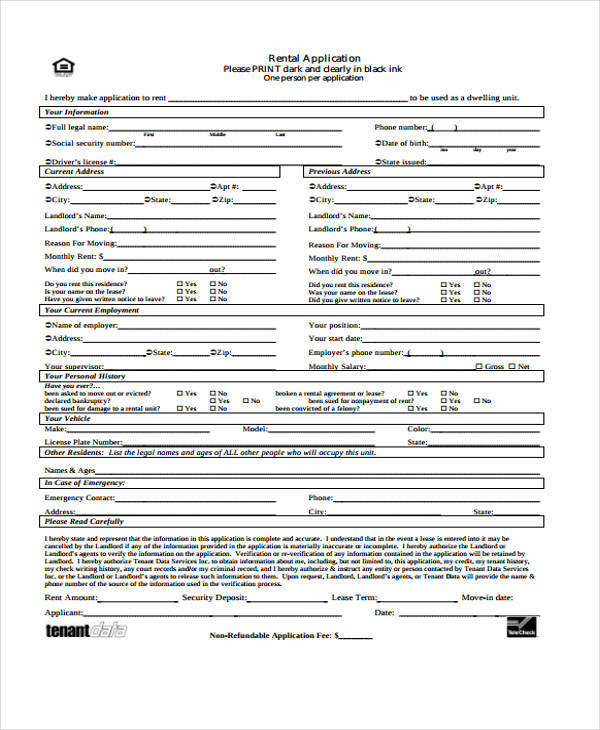 The application form is also important in the sense that the information gathered from the applicant shows companies and other institutions the various capabilities of the individual as well as their background. These sets of information can influence how well these individuals contribute to the setting they are applying to. People who found success in using these forms have been able to utilize its full potential and usefulness.